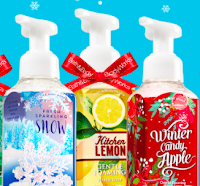 Today only, Bath & Body Works has all hand soap products for only $2.75 each! These would be perfect stocking stuffers! You can score this sale in-store or online (if shopping online use code SUDSY).